HELLO HOT SPRINGS! I HAVEN’T FORGOTTEN YOU. It is time, once again, to get involved in local “politics.” I was at a recent Watchmen of Garland County meeting and the subject was Oaklawn. Oaklawn is the local racetrack and casino. It appears that $40 million a month is not enough. At least that’s the number that I heard from a friend who knows quite a bit about what Oaklawn takes in. There is word in the air that another expansion is in the works. I don’t know how large the plans are, but one more “machine of skill” (That’s a short phrase that some of those who benefit from the casino use.) is too much for me. The plan is to show up at the City Board meeting on Tuesday, September 3rd, and voice our views on any expansion. I have already requested FOI information and plan to share it at the meeting unless there are so many who have had their lives ruined by a gambling problem willing to speak that time runs out. I’ve always viewed gambling as nothing more than a poor tax. From a Christian viewpoint, the Bible speaks of being content with what one has. Admittedly, I am not an angel when it comes to gambling. I’ve gambled thrice, that I can remember in the last 30 years. A boss of mine taunted me to gamble, knowing he would lose, just to see if I would gamble. I finally relented and won $20 (I think). He was so unhappy that I took him up on it that he paid me in pennies. I turned around and bet another employee about something that I knew I would lose and he ended up with the tainted gambling money. Another time, on a work related outing, I was given money to gamble. I ended up winning at a black jack table. I felt so bad I’ll never set foot in another casino as long as I live if I can help it. If you live in or near Hot Springs, I hope you show up at the meeting on September 3rd. Even if you don’t like to speak in front of people, it would be nice to fill the room with concerned citizens. The photo above is not suggesting that Oaklawn allows children to gamble. 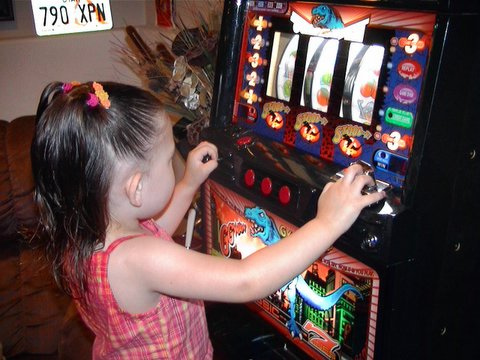 My point is that many children are affected adversely by the gambling industry. There are many Dads who wind up like the guy below because there are casinos in town. HERE is a link to an article about gambling sent to me by my friend, Kassey. This entry was posted on Thursday, August 15th, 2013 at 8:18 PM and is filed under Commentary, Hot Springs News, IMPORTANT UPCOMING MEETINGS, News, theology. You can follow any responses to this entry through the RSS 2.0 feed. You can leave a response, or trackback from your own site. 2 Responses to HELLO HOT SPRINGS! I HAVEN’T FORGOTTEN YOU. Thank you for the link, Kassey. I will put it on this post. It doesn’t surprise me that your parents know families that have been ruined by gambling. I am glad they are against the Oaklawn expansion. There is no question it is a pathological addiction and the internet has just exacerbated the problem. I look forward to reading you blog posts. It is always interesting to me to see your point of view.